The Hudson Yards project—an enormous residential and commercial development spanning much of the 30s and 40s on the west side—won't be fully completed for another decade, but it's already changing the landscape (and the prices) in neighboring Hell's Kitchen. Guest broker D.J. Dashti of Platinum Properties gives the rundown on one of Manhattan's most rapidly evolving 'hoods in this week's Buy Curious. I really like Hell's Kitchen, and with all the buzz about Hudson Yards getting built on the west side, I'm wondering if now is the time to buy in the area. Can I score a good deal? Will the construction drive me nuts? Unless you're holding out for one of the new buildings that's on its way in, you'd be wise to invest now if you're already looking to buy. When it's completed in 2024, the new Hudson Yards District will stretch from West 42nd Street down to West 30th Street between Eighth Avenue and the Hudson River, so it overlaps significantly with Hell's Kitchen, a busy restaurant and theater-oriented neighborhood that spans from West 37th Street to West 57th Street, also between Eighth and the river. The Hudson Yards development is expected to include around 16 skyscrapers worth of new apartments, office space, shops, bars, and restaurants, along with a school, a hotel, arts and events spaces, and 14 acres of public outdoor space. As part of the project, a new stop on the 7 train is also going in at West 34th Street and 11th Avenue, and is currently expected to open in November of this year, though I wouldn't be surprised if that date got pushed back to 2015. Whatever the case, it will get done, and between all the new construction and new amenities, you can expect prices to start climbing as soon as next year, when the first residential building in the project is set to open. Right now, the median price for a Hell's Kitchen one-bedroom is around $1.1 million in a condo building, and $647,000 in a co-op, so there's a lot of variation, and you can expect apartments in brand new projects to be significantly higher priced. As the west side transforms, more and more developers are getting in on the action by building fancy new condos--so if you've got the budget for a luxe pad with all the bells and whistles, you should have plenty to choose from. A few examples of what's already on the market: 540 West, Stella Tower, The Orion, and The Link. Many of these new developments--and even some built in the last decade or so--come with 421-a tax abatements, which can save you on your monthly property tax bill (but beware: these breaks gradually phase out, and sometimes mean you'll pay more upfront for the apartment). For example, The Atelier at 635 West 42nd Street, which opened in 2007, is offering an abatement through 2018. On the opposite end of the spectrum, prices vary in co-ops and older buildings. Studios sell for a median of $337,000, but average price per square foot varies significantly. Given that the neighborhood is pretty expensive across the board, price tends to depend much more on the individual building than on location or proximity to Hudson Yards, so your best bet is to look for specific deals. If you're hoping to buy in a quiet area, the key is, obviously, to avoid the construction--which will be going on for the next decade--particularly the West 30s between Ninth Avenue and the Hudson River. Generally speaking, you'll be alright if you're north of 42nd Street, though of course, you're near the theater district, Times Square, and other Midtown construction projects, so can count on a certain amount of noise almost anywhere you go. Want to spring for a luxury building? Hell's Kitchen 2-bedroom/2-bathroom condo, $1,655,000: This apartment in the 540 West development comes with quite a few amenities--a 24-hour doorman, roof deck, gym, even an on-site pet spa--and like many of the new developments coming into the area, the listing notes that a 421-A tax abatement is "anticipated." Hell's Kitchen 2-bedroom/2.5-bathroom condo, $4,350,000: Located in Stella Tower--a pre-war building that's been given a luxury condo makeover--apartments come with walk-in closets, en-suite bathrooms with heated floors, custom hand-laid oak flooring, and building amenities including an outdoor garden lounge, a 24-hour attended lobby, and fitness center. 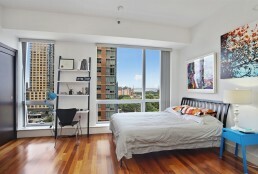 Hell's Kitchen 2-bedroom/2-bathroom condo, $2,375,000: Located in the Orion condo building, this apartment has a 421-a tax abatement, so monthly taxes are $620. 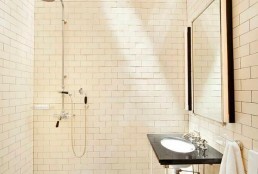 The building includes concierge service as well as a pool, sauna, steam room, and sun deck. What if your budget is more down to earth? 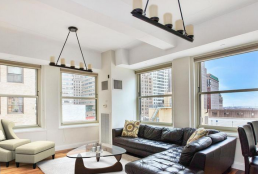 Hell's Kitchen 2-bedroom/1-bathroom co-op, $549,000: This co-op on West 47th Street between Eighth and Ninth Avenues is in a brownstone with 11 other apartments. It's an HDFC co-op, meaning that houshold incomes are limited to $72,150 for one person, $82,500 for two people, and $92,775 for three. 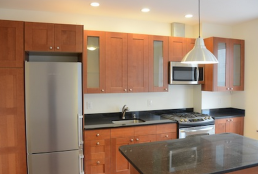 Hell's Kitchen 1-bedroom/1-bathroom co-op, $400,000: Another HDFC option, this recently renovated one-bedroom allows pets, features hardwood floors, in-building laundry, and lots of natural light and has an income restriction of $99,000 per year. Hell's Kitchen studio/1-bathroom co-op, $410,000: You couldn't ask for a more central location than this studio at 408 West 34th Street (between Ninth and 10th Avenues), which was recently renovated and includes hardwood floors, frosted glass walls, in-building laundry and storage, and access to a parking garage. How can I soundproof my apartment? New Yorkers who live near Times Square: crazy or onto something?